On this date in 1948, an alleged spy was extrajudicially executed by the Israeli Defense Forces. This execution occurred during a short truce punctuating Israel’s War of Independence, but prior to the ceasefire the nascent IDF had become suspicious at Jordan’s gift for accurately targeting critical infrastructure in Jerusalem. 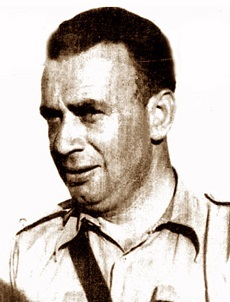 Suspicions came to settle on Meir Tobianski a Lithuania-born former British officer who had become a captain in the Jewish militia Haganah: as an employee of the Jerusalem Electric Corporation, he would have made a great informant for enemy artillerymen. The chief of these four, Isser Be’eri, was later charged with manslaughter for the affair, receiving a symbolic one-day sentence. His subordinates, who were never charged, had long careers in Israeli intelligence; one of them, Binyamin Gibli would go on to help cook up a subsequent espionage debacle, the Lavon Affair. Tobianski has been officially rehabilitated by Israel. Despite the irregularity of the proceeding against him, he’s sometimes described as the first of only two executions in Israeli history, alongside the much more procedurally defensible hanging of Adolf Eichmann. 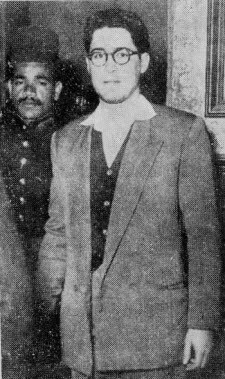 On this date in 1955, two Egyptian Jews enrolled by Israeli intelligence as saboteurs were hanged in Cairo. Marzouk (left) and Azar, from this page. The strange and disturbing “Lavon affair” — or “Esek habish,” the “shameful affair” — has never had a completely satisfying explanation. The germ and the goal of this project have been fodder for speculation ever since; the most commonly accepted theory is that it was intended to trigger western intervention or pressure on Egypt that would prevent Nasser from nationalizing the Suez Canal. 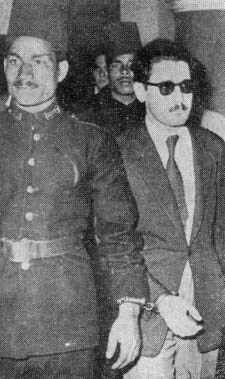 Initially blamed on the Defense Minister Pinhas Lavon, unrelated court testimony in 1960 would reveal that he was a fall guy. The dovish government of Moshe Sharett fell; hawkish founding Prime Minister David Ben-Gurion was recalled from retirement in a Negev kibbutz; and Israel launched a reprisal raid at Gaza. Little more than two years later, Israel and Egypt would contest control of the Suez on the battlefield.